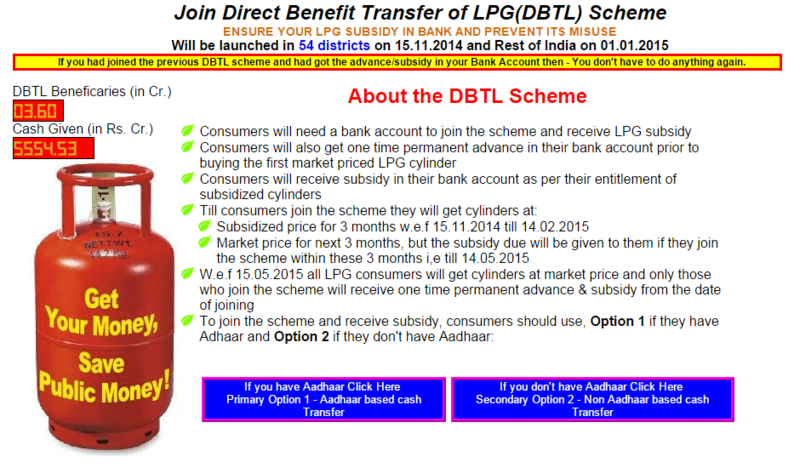 DBTL-Direct Benefit Transfer of LPG is a scheme of Ministry of Petroleum and Natural Gas by Government of India. The scheme let LPG (Liquid Petroleum Gas) consumers receive their LPG subsidy direct to their bank account and prevent its misuse. Recently government has reviewed the scheme and after examining the difficulties faced by the consumer. Option I (Primary): Wherever Aadhaar number is available it will remain the medium of cash transfer. Thus, an LPG consumer who has an Aadhaar Number has to link it to the bank account number and to the LPG consumer number. Know more about details instructions on how to proceed on Option I or Option II Click Here! © 2014 Espreson a Digital Magazine All Rights Reserved.